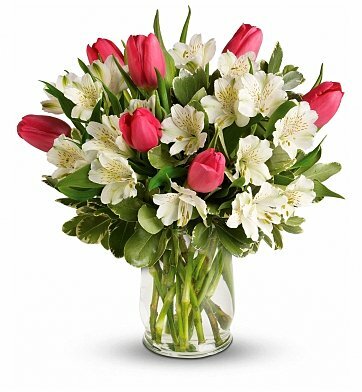 Keep the romance alive all year long with this loving display of fresh-cut pink tulips kissed by the sun, perfectly complemented by striking white alstroemerias playfully arranged amongst the bunch. Blooming Romance Bouquet is a hand delivered gift. These gifts are delivered by one of our local design centers located throughout the United States and Canada. Same day delivery is available for most gifts when ordered before the cutoff time. The cutoff time for Blooming Romance Bouquet is 2 PM in the recipient's time zone. Delivered on time. Had no problems getting it delivered. OK I was very uneasy about sending flowers through a site I'm unfamiliar with, but I guarantee you it was the right choice! The flowers were stunning and delivered on time in a very professional manner. Definitely will reorder!! The flowers were beautiful and handled and delivered professionally. I did this on a whim but it went so well, I have no hesitation at this florist again in the future. I've ordered flowers with online florists before, however, the quality was always poor. I will always use this Flower Shop because the quality and presentation of the bouquets are outstanding. Our daughter and family states away from us. We decided to send her a Mother's day bouquet. Not knowing a local florist, I searched on line, and after reading many positive reviews, I chose YOU!! My daughter loved the gift, and sent me a photo of it. It is beautiful. thank you. You have a new customer!! I sincerely recommend you. Your work is beautiful, and you deliver what you promise. Calling in an order from out of state, I was worried. I felt I was at the mercy of the florist, but my co-workers father had passed away and we needed to send flowers. This company provided excellent customer service to me when the funeral home refused the flowers because the funeral was later than I had anticipated. They kindly re-delivered fresh flowers on the proper day at no additional cost to me and they were beautiful! Very beautiful arrangement that was well received, and made a very good impression. This bouquet went out on the same day it was ordered. My friends were really pleased by the beauty, style and fresh flowers of this bouquet. Thank you for making my friends happy and your new customer happy. I sent these to my wife just to surprise her and they did. She loved the arrangement and the colors. It brightened her spring day! These were sent for mother's day. My mom, who has great taste loved them! I am told they were delivered on time, which pleasd me greatly, as I live on the other side of the country from my parents. all I was hoping for. I sent these to my daughter (23) on her birthday. She loved them, called me immediately, and wanted me to know that she had received them.